0. A corin belt is used for maintaining a beautiful notch neck. 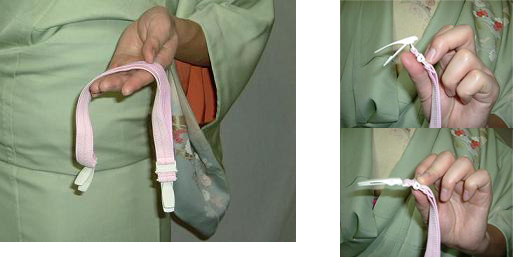 It is attached at the point of the process after 'How to wear a kimono' is finished, and before 'How to tie an obi' starts. 1. 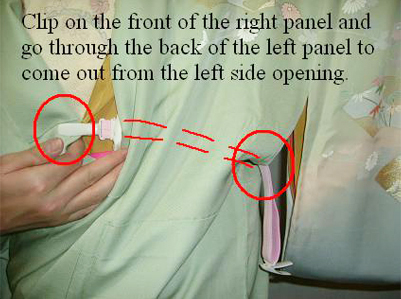 With a corin belt, clip the front of the right panel and put it through the back of the left panel to come out from the left side opening under the left sleeve. 3. 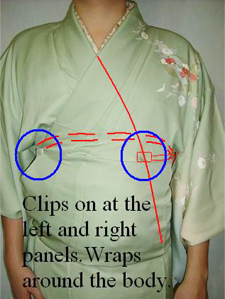 Wrap around your body from the left opening to the right side of your body, and clip the left panel. 4. Align the collar neatly, and finished.